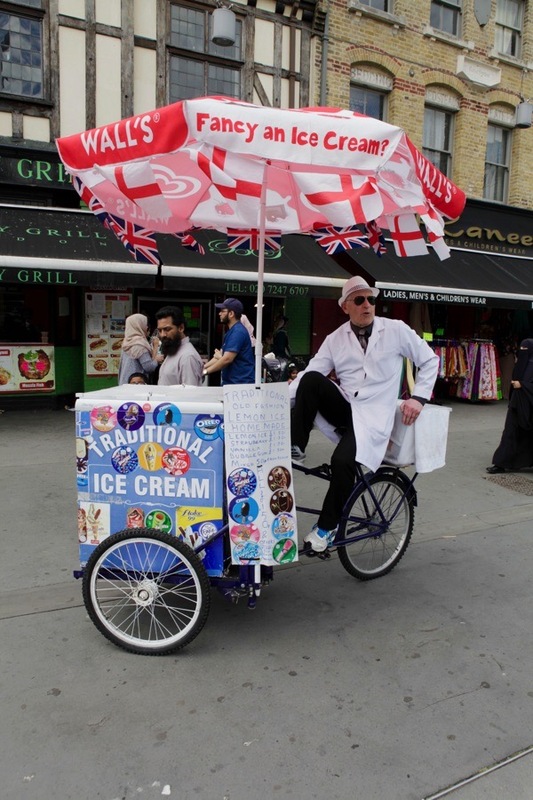 Contributing Photographer Colin O’Brien & I encountered Ice Cream Seller, George Parrin, coming through Whitechapel Market on his bicycle last weekend. 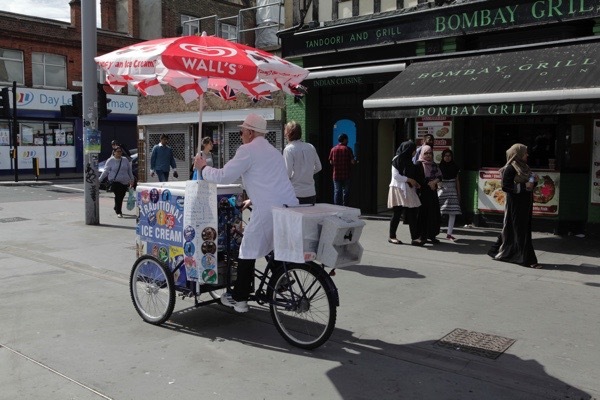 Even before we met him, his cry of ‘Lovely ice cream, home made ice cream – stop me and buy one!’ announced his imminent arrival and then we saw his red and white umbrella bobbing through the crowd towards us. 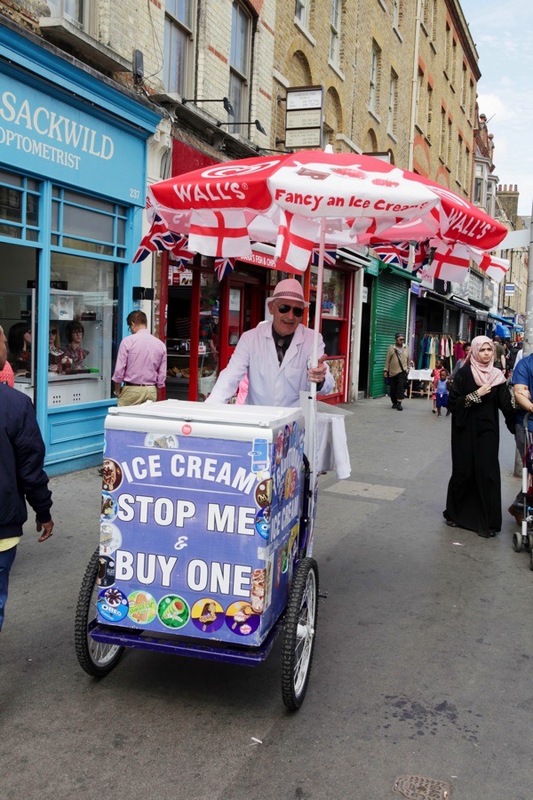 George told me that Whitechapel is the best place to sell ice cream in the East End and, observing the looks of delight spreading through the crowd, we witnessed the immediate evidence of this. 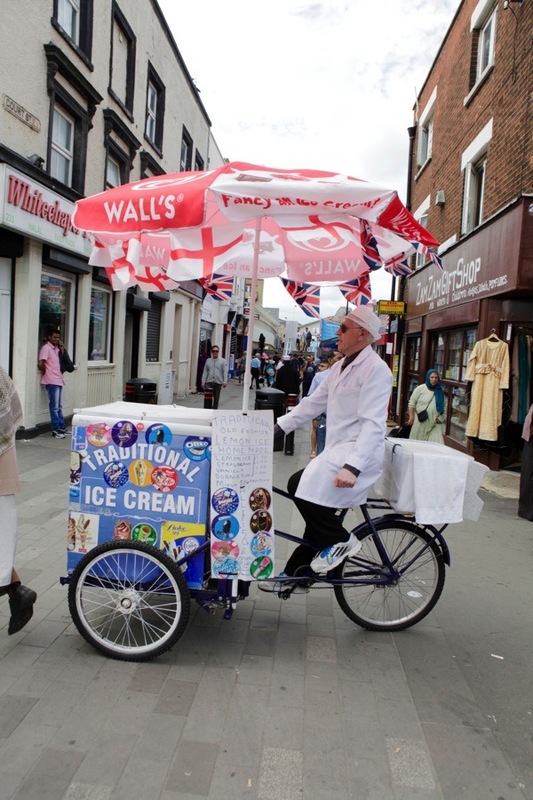 Such was the demand on that hot Saturday afternoon that George had to cycle off to get more supplies, so it was not possible for me to do an interview. Instead, we agreed to meet outside the Beigel Bakery on Brick Lane on Friday afternoon where trade was a little quieter. 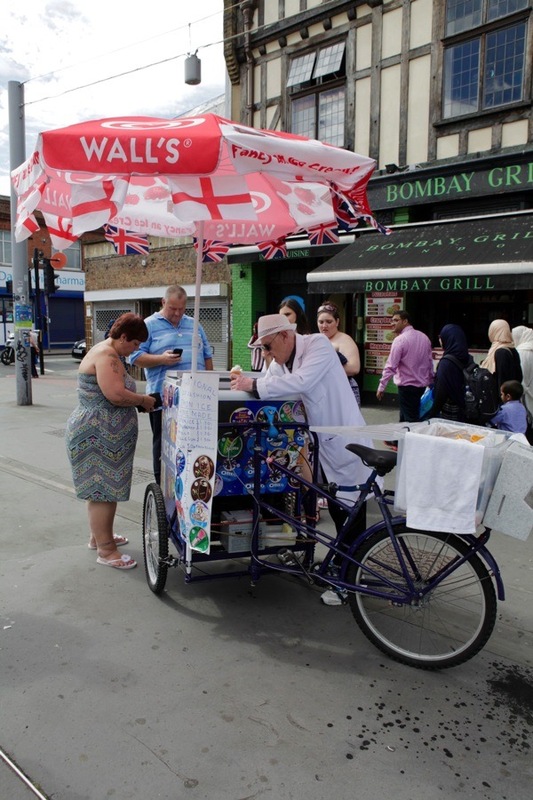 On arrival, George popped into the bakery and asked if they would like some ice cream and, once he had delivered a cup of vanilla ice, he emerged triumphant with a cup of tea and a salt beef beigel. ‘Fair exchange is no robbery!’ he declared with a hungry grin as he took a bite into his lunch. “I first came down here with my dad when I was eight years old. He was a strongman and a fighter, known as ‘Kid Parry.’ Twice, he fought Bombardier Billy Wells, the man who struck the gong for Rank Films. Once he beat him and once he was beaten, but then he beat two others who beat Billy, so indirectly my father beat him. In those days you needed to be an actor or entertainer if you were in the markets. My dad would tip a sack of sand in the floor and pour liquid carbolic soap all over it. Then he got a piece of rotten meat with flies all over it and dragged it through the sand. The flies would fly away and then he sold the sand by the bag as a fly repellent. I was born in Hampstead, one of thirteen children. My mum worked all her life to keep us going. She was a market trader, selling all kinds of stuff, and she collected scrap metal, rags, woollens and women’s clothes in an old pram and sold it wholesale. My dad was to and fro with my mum, but he used to come and pick me up sometimes, and I worked with him. When I was nine, just before my dad died, we moved down to Queens Rd, Peckham. I’ve been on a bike since I was two, and at three years old I had my own three-wheeler. I’ve always been on a bike. On my fifteenth birthday, I left school and started work. 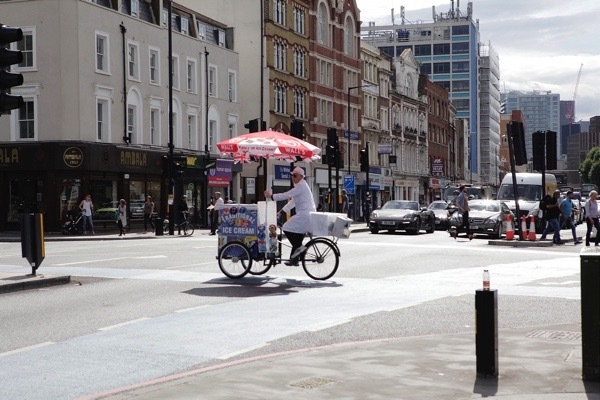 At first, I had a job for a couple of months delivering meat around Wandsworth by bicycle for Brushweilers the Butcher, but then I worked for Charles, Greengrocers of Belgravia delivering around Chelsea, and I delivered fruit and vegetables to the Beatles and Mick Jagger. At sixteen years old, I started selling hot chestnuts outside Earls Court with Tony Calefano, known as ‘Tony Chestnuts.’ I lived in Wandsworth then, so I used to cycle over the river each day. I worked for him for four years and then I made my own chestnut can. 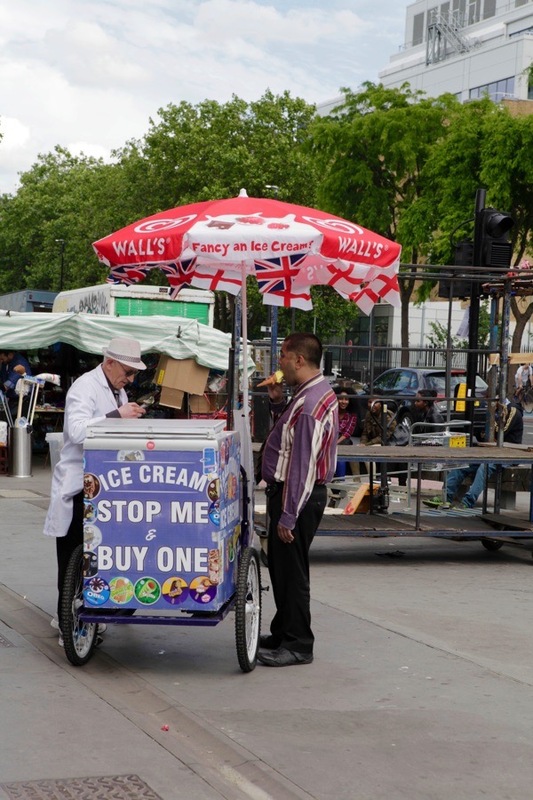 In the summer, Tony used to sell ice cream and he was the one that got me into it. I do enjoy it but it’s hard work. A ten litre tub of ice cream weighs 40lbs and I might carry eight tubs in hot weather plus the weight of the freezer and two batteries. I had thirteen ice cream barrows up the West End but it got so difficult with the police. They were having a purge, so they upset all my barrows and spoilt the ice cream. After that, Margaret Thatcher changed the law and street traders are now the responsibility of the council. The police here in Brick Lane are as sweet as a nut to me. I bought a pair of crocodiles in the Club Row animal market once. They’re docile as long as you keep them in the water but when they’re out of it they feel vulnerable and they’re dangerous. I can’t remember what I did with mine when they got large. I sell watches sometimes. If anybody wants a watch, I can go and get it for them. In winter, I make jewellery with shells from the beach in Spain, matching earrings with ‘Hello’ and ‘Hola’ carved into them. I’m thinking of opening a pie and mash shop in Spain. I’d love to know the recipe for George’s homemade ice cream. He must have to make huge batches of it in the summer. 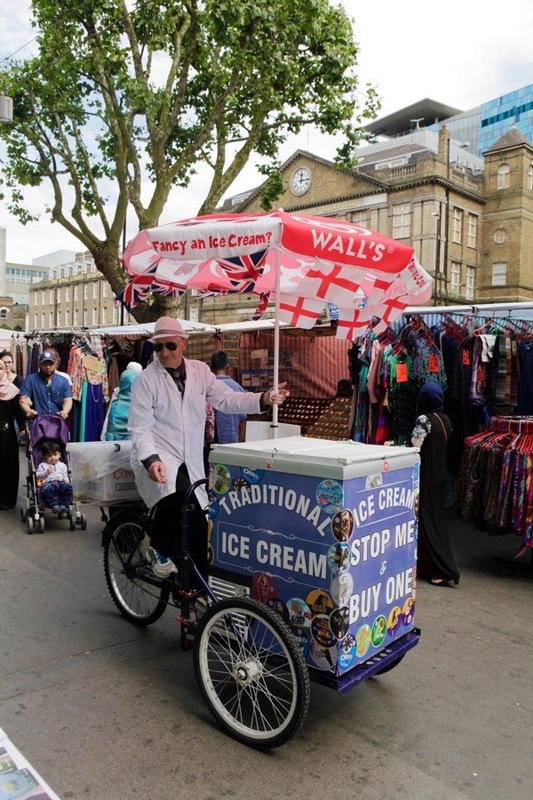 My granny used to make ice cream and take it on a barrow to Stanley Park in Blackpool near where she lived. She said it was the hardest work she’d ever done, but managed to buy a small shop on the proceeds! 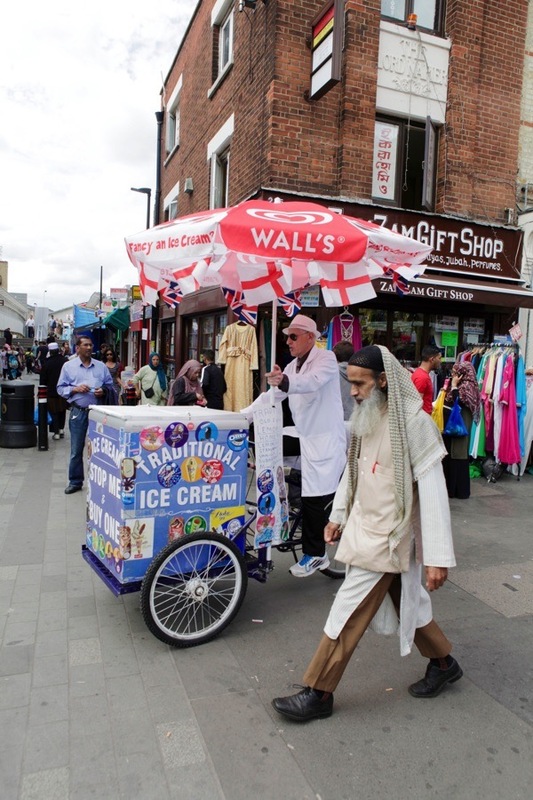 Why does the umbrella/sunshade say WALL’S? 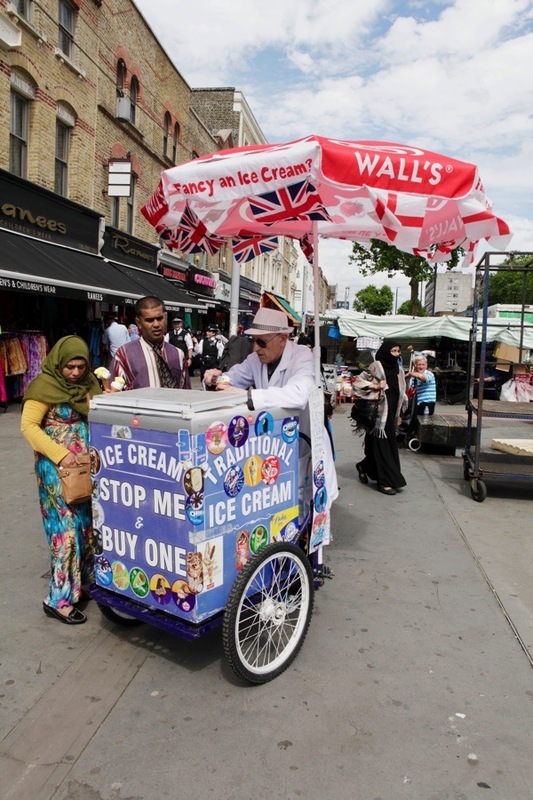 I would be put off as I wouldn’t buy a Wall’s ice cream for love nor money. 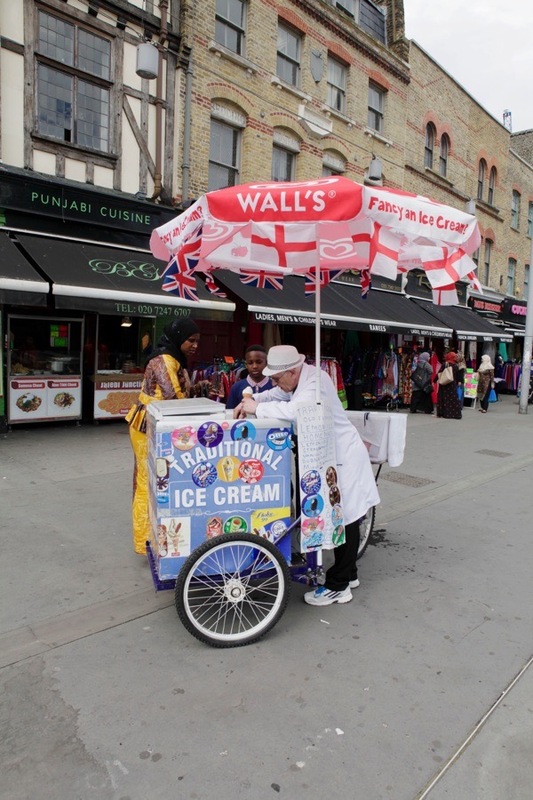 Does George really make his own ice cream or is it Wall’s I am very puzzled. Absolutely wonderful! Thanks to Colin & the GA.